My first attempt was swatching polishes onto strips of tape and sticking them into a blank notebook. 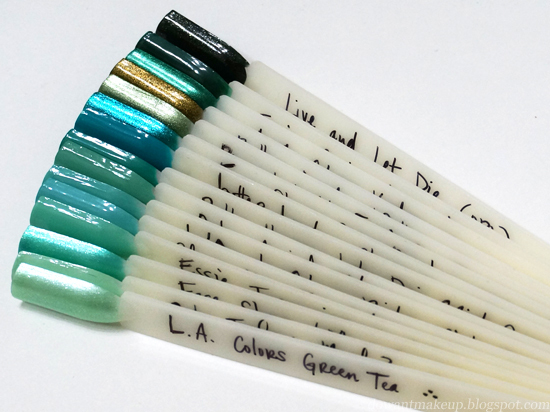 This actually isn't a terrible idea, but I felt it was difficult to plan for future polishes. 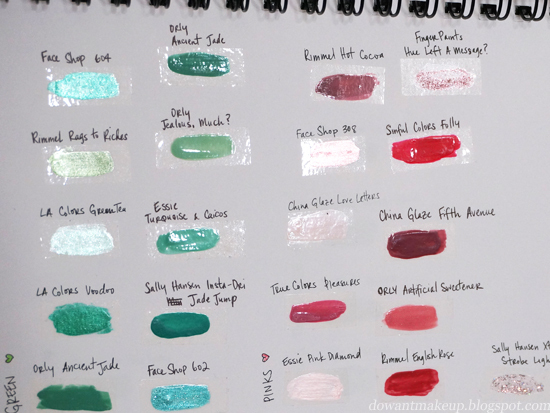 My green polishes might only need a page now, but what about a year or two from now? How many blank pages should I leave for future greens before I start a blues page? Plus, I could swatch my greens in order of hue now, but what about when I get a shade that fits right in between two that were already swatched? Seriously, these kind of thoughts drove me crazy. After a few days of research (i.e. 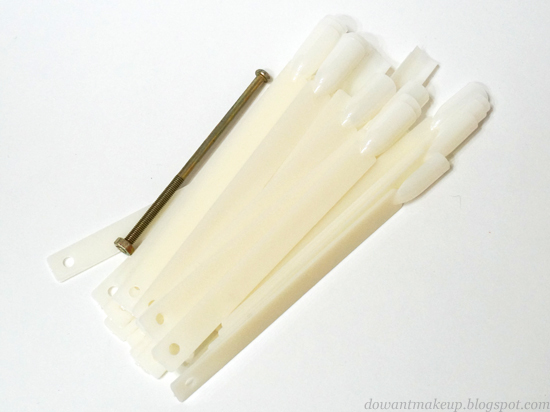 Googling), I found prettier alternatives in nail display sticks and wheels. 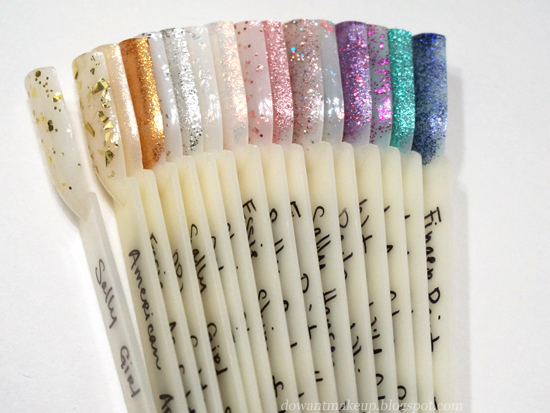 I've noticed many nail bloggers use nail wheels (nails arranged around a plastic circle) instead, but again the fact that the positions of each swatch relative to each other are fixed bothered me. The inner circle also doesn't give you much room to label each swatch; I've seen it done successfully but many others keep a numbering system which seems inconvenient. However, nail wheels probably store way easier since they lay flat and can be stacked. The nail sticks are like the ones you see at some salons or Sally's: they are long enough to label and most importantly, they can be arranged and rearranged to my heart's content. Sold! 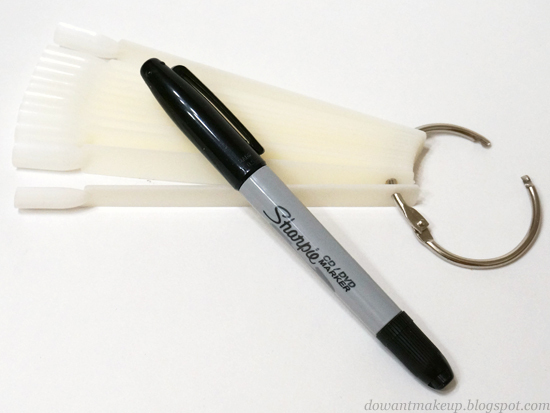 Here's basically how the nail sticks arrive, sealed in ziplock bags. There are tons of eBay sellers offering what seems to be an identical product, but for reference the one I bought from sold them in sets of 50 for $5-6 CAD and free shipping. Most also include a long bolt and nut to slip through the holes at the end of the stick to make a fan. 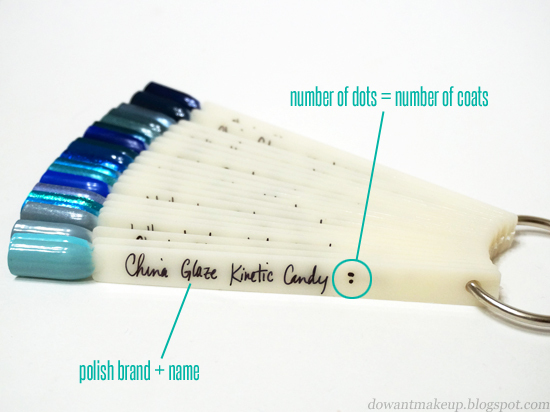 I use the ultra fine end of the Sharpie to write the name of the polish, and the fatter end to make 2-3 dots indicating how many coats I used on the swatch. Everybody will have their own way of organizing their swatches (by brand, by finish, etc.) and mine is to organize each ring by colour, so I have a blue ring, a purple ring, a neutrals ring, and so on. I try to arrange the sticks by hue, though with different finishes and shimmers it's definitely not perfect--but the nice thing (and what I've been trying to achieve all along) is that I am always free to change the order around. Pinks, reds, oranges, and yellows all get thrown on one ring because I don't have enough polishes in each colour to justify separate rings. Plus, doesn't it look so pretty like this? Exception to colour rings: polishes that I feel need to be layered with another polish underneath (glitters with no colour base, basically). It makes sense to me to put them on their own ring so I can compare them to polishes from other rings and decide what to wear together. 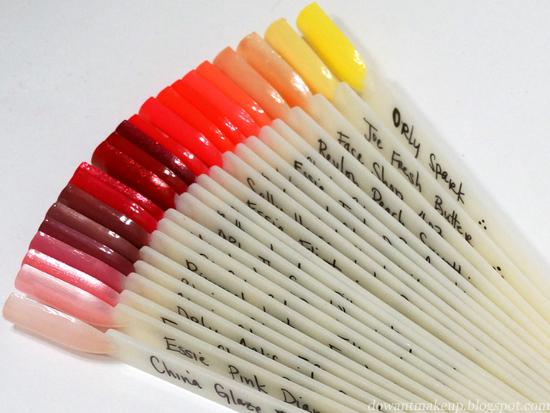 Do you have display swatches of your polish collection? How do you (or would you) arrange your swatches?